Mumbai: February 20th, 2017: India’s largest municipal corporation Brihanmumbai Municipal Corporation( BMC) is going to the polls February 21st. 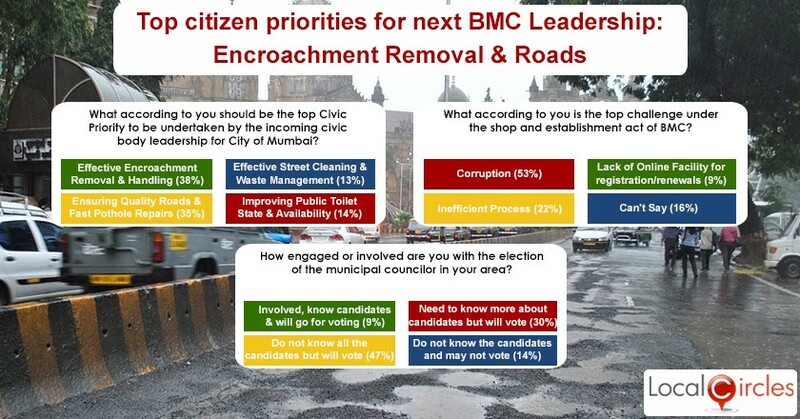 While the battlelines are being drawn on political and even caste lines, LocalCircles, a citizen engagement platform decided to ask the citizens of Mumbai about what their expectations were from the Municipal Corporation. 68% of the respondents were male while 32% were females. The objective of this survey, which received more than 10,000 votes, was to set the decision parameters for selecting the municipal councillors on the basis of the needs of the city. There were two major issues that were identified by citizens as the top most requirement for the city. Approximately 38 % of the citizens who polled voted for the removal of encroachments which is a nightmare in a city where pavements and public spaces are constantly vanishing. Encroachment is so rampant in the city that many citizens have taken it as part of their lives. In populous Mumbai, pedestrians have lost their right of walking on pavements due to encroachments. 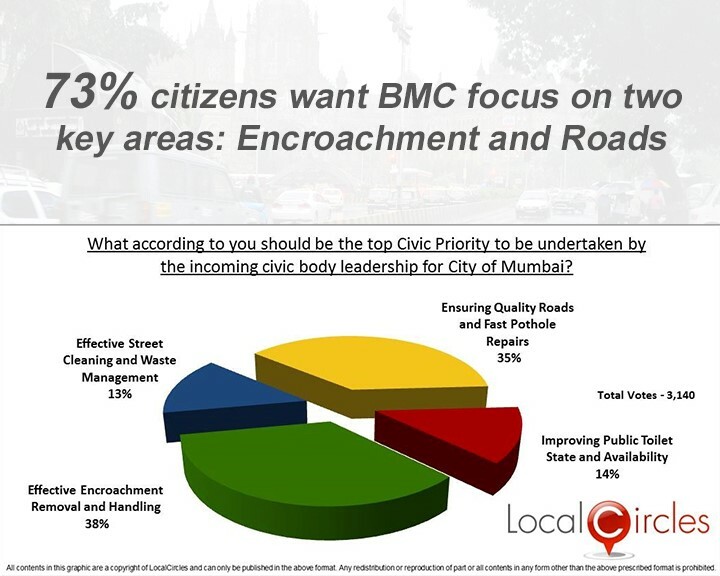 The second issue identified was quality of roads in the city and quick repairs of potholes with almost 35% of the citizens voting for this as the top most priority. While BMC is the richest municipal corporation it has still not been able to resolve the issue of quality roads. Cleanliness in the streets and waste management was identified as the next big challenge by 13 % of the citizens, while 14% pointed out towards improving public toilet availability in the city. 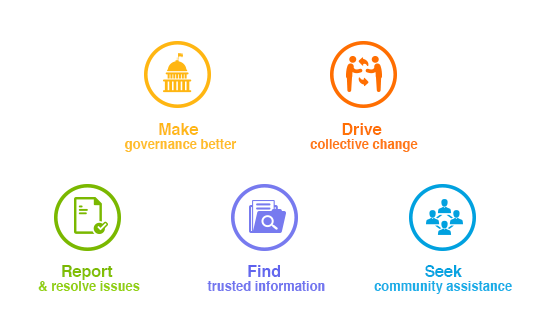 Based on these parameters citizens can now ask candidates in their areas about their plan to address these issues. One of the biggest revenue source for the BMC is the registration fees collected from businesses under the Shop and Establishment Act. 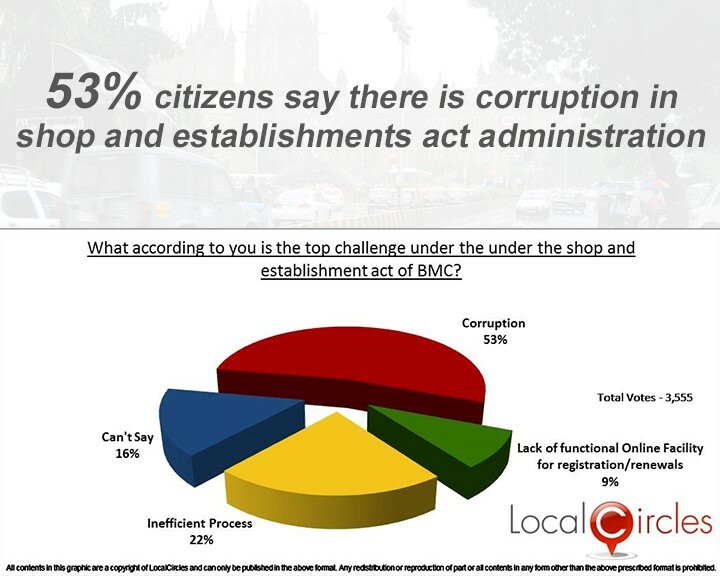 According to business owners, this is a major area of corruption in BMC with 53% citizens asking for it. Inspite of automation of the process of filing this tax the systems have been hijacked by dubious agents in collusion with BMC. As a result the process has actully become inefficient as per 22 % of the citizens. Bribes are the norm for even online payment for this registration. BMC polls do not see participation by all sections of the population in the city. The low participation by citizens means that only certain sections get higher representations in the polls. 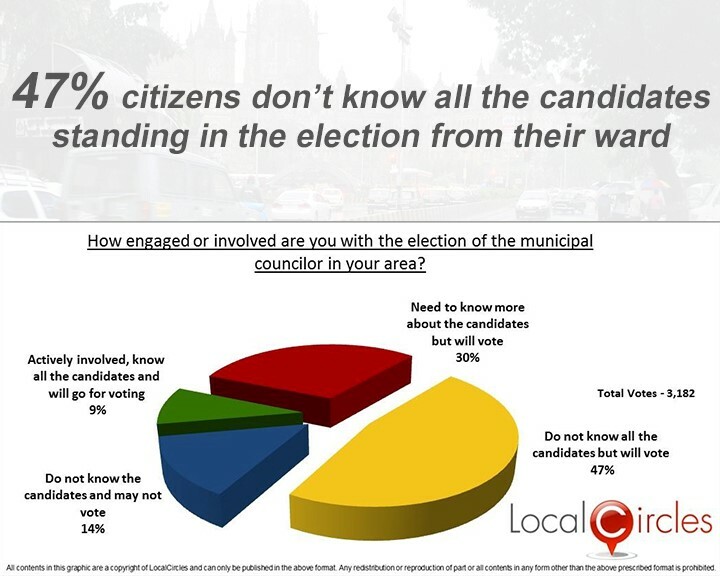 This is quite clear as 47% of the citizens polled said that they do not know all the candidates that are standing from their wards but will vote. Another 30 % said that they need to know more about the candidates but will go vote. Only 9 % of the citizens said that they are actively involved in the election process and will vote. While most citizens do not want to admit that they will not vote the lack of educated voters participating in these elections is a cause of concern. In a structured discussion in the ‘Residents of Mumbai’ community on LocalCircles which has more than 40,000 members, citizens also asked the drains in the city to be covered, waste management system to be modernized, corruption in the municipality to be reduced. Citizens have also specifically asked for an online interface between the municipal leadership and the citizenry for municipal policy consultation and citizen inclusion. Some members also suggested that such administration-citizen interfaces be enabled at the ward level to ensure better civic services in the city.